The Clean Water Rule, as it is known, was promulgated in 2015 to redefine “waters of the United States,” a term used to prescribe the limits of federal wetlands permitting jurisdiction on private property by the U.S. Corps of Engineers pursuant to the Clean Water Act (CWA). The controversial rule is the response of the U.S. Environmental Protection Agency (EPA) and the U.S. Army Corps of Engineers (Corps) to several U.S. Supreme Court decisions that questioned the Corps’ expansive view of its permitting jurisdiction pursuant to Section 404 of the CWA. Once promulgated, the Clean Water Rule was challenged by a number of states, private parties, and environmental organizations in various federal courts, alleging, in part, that the rule exceeded the authority of the CWA. The Sixth Circuit stayed the Clean Water Rule nationwide, and the U.S. Supreme Court heard argument this past October on whether the jurisdiction over challenges to the rule should sit with the federal appellate or district courts. At this time, because of the Sixth Circuit’s stay, the pre-2015 rule defining “waters of the United States” remains in effect. The stay of the 2015 Clean Water Rule has allowed the Trump administration to focus on repealing the rule and replacing it with one that would curb the Corps’ jurisdiction over waterbodies such as wetlands. 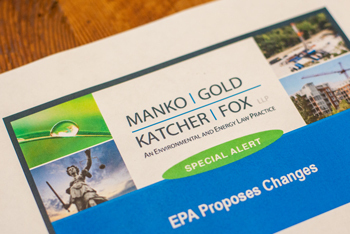 This past July, EPA and the Corps initiated a two-step rulemaking process to (1) reinstitute the prior-2015 rule which is currently in place due to the Sixth Circuit’s stay of the Clean Water Rule; and (2) propose a new definition of “waters of the United States” consistent with the principles of limited jurisdiction outlined by the late Justice Scalia in Rapanos v. United States, one of the U.S. Supreme Court cases leading to the promulgation of the 2015 Clean Water Rule. While the agencies work on replacing the Clean Water Rule, they also published a proposed rulemaking to extend the applicability date for the 2015 Clean Water Rule until two years from the date on which that rulemaking becomes final. Thus, the legal challenges to the Clean Water Rule currently working their way through the court system may prove moot if the Trump administration succeeds in entirely replacing the Clean Water Rule, thereby limiting the Corp’s Section 404 permitting authority pursuant to the CWA.